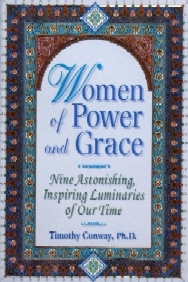 Participants in this special offer can purchase from us brand new, substantially discounted copies of the widely acclaimed book, Women of Power and Grace: Nine Astonishing, Inspiring Luminaries of Our Time, by Timothy Conway, Ph.D. 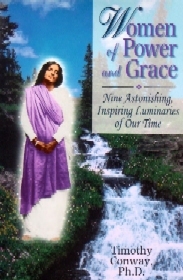 This 352-page book features biographical sketches on each of nine amazing women, over 30 photos, and 120 pages of their dazzling teachings on wisdom, devotion, and God-realization. Significantly, with its last and longest chapter, Women of Power & Grace was the first publication for the USA booktrade to present the now world-renowned and much-honored holy woman of India: Amma, the "Hugging Mother" Mata Amritanandamayi. Women of Power & Grace garnered very positive reviews (click on link to read the testimonials and a more detailed outline of the chapter contents). To order one or more copies of Women of Power & Grace for yourself and/or your loved ones, just send to our contact address below a check or money order for just $12 for the softcover edition of the book, which includes free bookrate shipping (the book retails for $16.95 + tax in the bookstores, and shipping is normally $3.50) or just $14 for the hardcover edition and free bookrate shipping (discounted from the retail price of $22.95 + tax; note its different cover, on the left, showing the holy woman Anandamayi Ma of India). If you can only pay by credit card, you can buy from us brand new, slightly discounted copies (a bit more expensive) of the softcover or hardcover editions of WPG at Amazon.com's Amazon Marketplace. To learn of our other forthcoming titles, see the main page for the Wake Up Press at our www.enlightened-spirituality.org website.